Mobile devices, such as phones and tablet computers, have become ubiquitous. The availability of access to patient images on mobile thin clients can facilitate the utilization of these devices in a variety of medical environments. When considering the uses of mobile devices in healthcare imaging, users will benefit from understanding how devices can be used and the necessary considerations associated with these uses to ensure medical practitioners make optimal decisions for patient care. Clear articulation of how a practice might utilize mobile technology can also assist in properly selecting equipment, software, and quality control procedures that deliver the desired quality and safety. In this work, we provide examples of potential use cases for the display of medical images on handheld devices that have been considered or studied. Current mobile viewing technologies with limited workspaces are unlikely to replace dedicated radiology workstations better suited for conventional radiology workflow and standard primary reporting. However, mobile devices are enabling timely patient management and collaboration in care. In this context, capabilities and limitations of the displays of mobile devices must be understood by users. In addition, clear procedures to promote best practices in the use of handhelds are required. The use of handheld devices in imaging introduces a number of special considerations related to information technology infrastructure, requirements for adequate performance in terms of uptime, support, and access via cellular, internet, or intranet systems, loss or theft and adequate security policies and procedures, and the adequacy of representing image details. This report focuses on providing overarching considerations for the use of handheld devices in medical imaging. 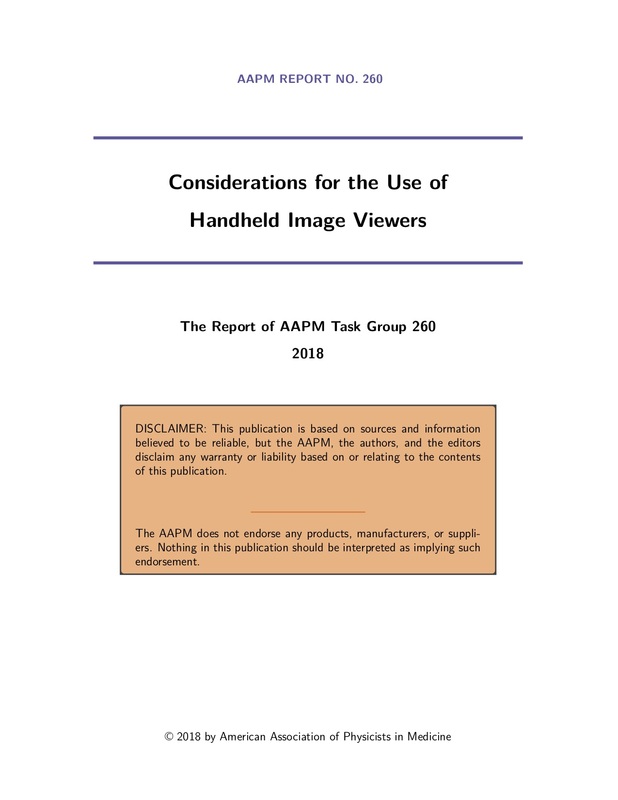 Operational differences for handheld image viewers include variable ambient illumination, variable viewing angle and viewing distance, motion, touch, calibration issues, and connectivity and image compression. The ambient lighting environment for handheld displays can be substantially different from the standard viewing conditions for medical monitors. The unlimited mobility available to the handhelds means that they may be used in a wide range of illumination conditions, from the dark of night to full daylight. The addition of the touch screen typically tends to increase the amount of reflected light since many technologies require high refractive index films. The manufacturers partially mitigate this effect with anti-reflection coatings. But users often add protective cases for their handheld devices which defeat the manufacturer’s efforts in reducing screen reflections. Most commercial handheld displays are calibrated at the factory to render images in the sRGB color space. Therefore, they will not render a grayscale image the same as a medical monitor with a standard grayscale calibration. Likewise, as the medical industry works toward standardizing the color space for medical imagery, most off-the-shelf handheld devices 90 will need to be re-calibrated in order to match that color space. The calibration process is complex for the handheld devices due to the limited access provided by the operating system software. Current operating system restrictions prevent a general and open means for the calibration information to be shared between different image viewing software. Therefore, present calibration solutions are typically closed systems. However, limiting what software can be used to view calibrated images significantly hampers the flexibility and value of the calibration. There is a great need for the major operating system developers to allow greater access to the color management attribute. A calibration through look-up table correction might reduce the number of gray levels being displayed. An indication of such a calibration to the user should be good practice. In addition, a visual check with a full gray ramp might 100 visualize possible banding issues. In most cases, there will be unavoidable reflections from diffuse ambient lighting that reduce image contrast. Handheld image viewers are practical and widespread. Understanding the limitations of their use and knowing when and how to use them is paramount to high-quality patient care delivery. The considerations described in this report are useful in expanding and ensuring safe use of these devices in the clinical environment.